Since 2013, Austin Chalk has staged a major come-back, thanks to application of horizontal drilling in combination with modern fracturing technologies. The play is estimated to host an enormous amount of undiscovered resources, though it has its unique risks. The area has infrastructure support and is close to the Gulf Coast product market. 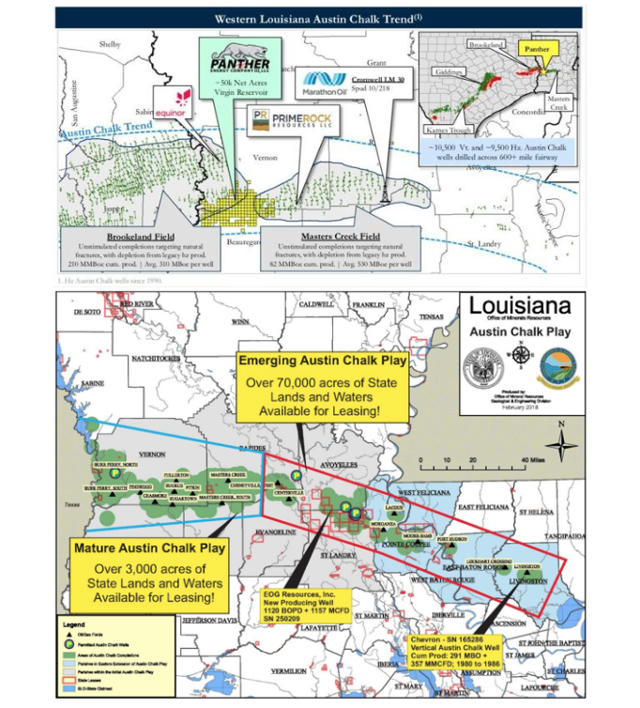 Numerous operators have taken up Austin Chalk acreage in Louisiana and the Giddings area. The Upper Cretaceous Austin Chalk in the Gulf Coast forms a low-permeability, fracture-rich reservoir, which has been revived over the past few years as an unconventional resource play. 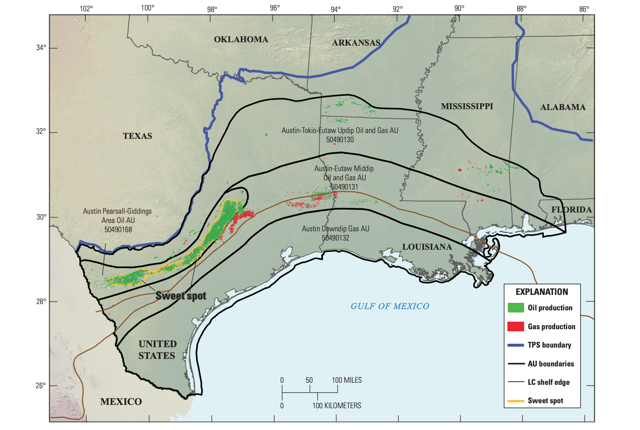 The Austin Chalk occurs along a crescent stretching from Maverick and Zavala Counties in South Texas, via Burleson, Brazos and Grimes Counties, to Tyler, Jasper, and Newton Counties in East Texas, before extending further east into central Louisiana (Fig. 1). Fig. 1. The Austin Chalk trend in Gulf Coast. Source. The Austin Chalk Formation is made up of chalk (a soft white limestone formed from the skeletal remains of trace fossils) with some bands of clay, shale and organic-rich marl. 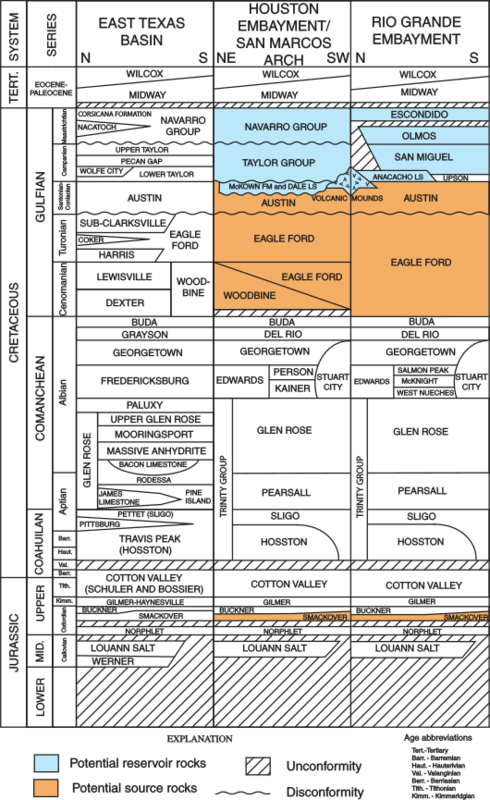 Stratigraphically, the Austin Chalk overlies the shales of the Eagle Ford Formation (Fig. 2). Fig. 2. 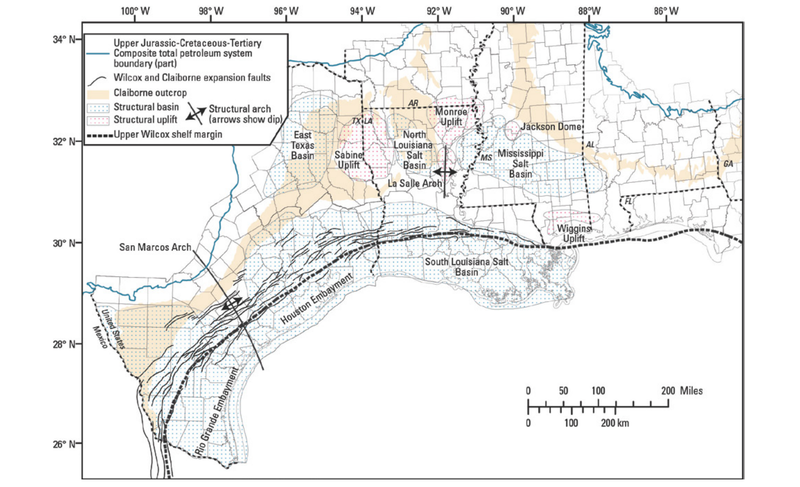 The stratigraphy of the Texas Gulf Coast. Source. The Austin Chalk was deposited in the Late Cretaceous age in shallow water on the stable, gently-dipping shelf of the Gulf Basin. Its thickness increases downdip from less than 100-ft to over 650-ft at depths of 9,500-ft. 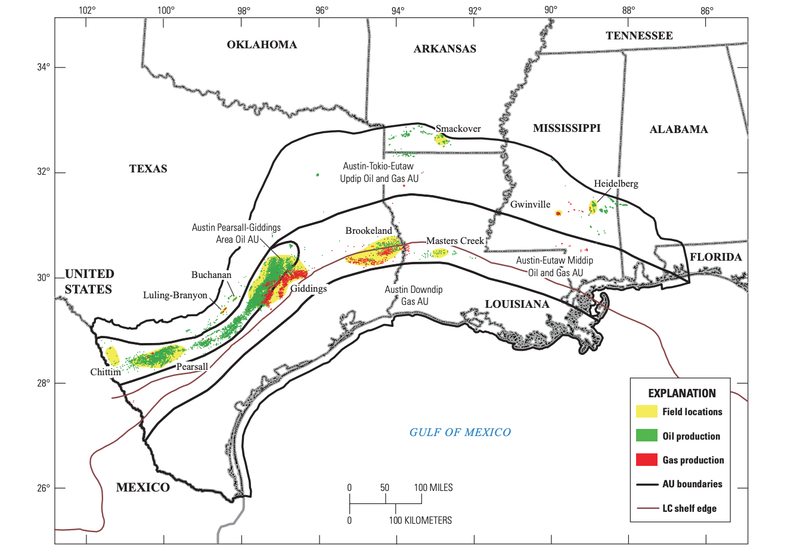 Along the strike of the trend, thickness also varies; the formation exceeds 1,000-ft in thickness in the Rio Grande Embayment in South Texas, thins across the San Marcos Arch, and thickens again in the East Texas Basin (see here). In Louisiana, the Austin Chalk sits in much greater depths (approximately 14,500-ft) (see here) (Fig. 3). Fig. 3. 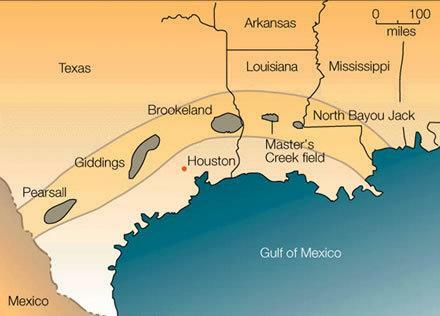 A map showing tectonic elements of the Gulf Coast. Source. From the 1920s to end-2016, the Austin Chalk cumulatively produced 948 MMbo and 5.6 Tcfg. Major fields include, from west to east, Chittim, Pearsall, Luling-Branyon, Buchanan, Giddings, Brookeland, Mastercreek, Smackover, Gwinville, and Heidelberg (Fig. 4). Of them, Giddings is the largest, with cumulative production of 526 MMbo and 4.7 Tcfg (see here). Fig. 4. Major conventional fields in the Austin Chalk. Source. Initially, producers targeted the natural fracture zones in the chalk but high initial rates of production quickly declined due to the draining of the open fracture systems. A vintage article described the Austin Chalk as "the most perverse, contrary, incorrigible oil field known to man" (see here). The subsequent oil production from the Austin Chalk is basically a history of using technology to access oil stored in the matrix porosity and produce it more consistently than from the natural fractures. In the late 1970s, operators applied fracturing stimulation technique in vertical wells to produce oil from the matrix porosity, which resulted in a rapid increase in production. In the early 1990s, it was horizontal drilling did the trick. 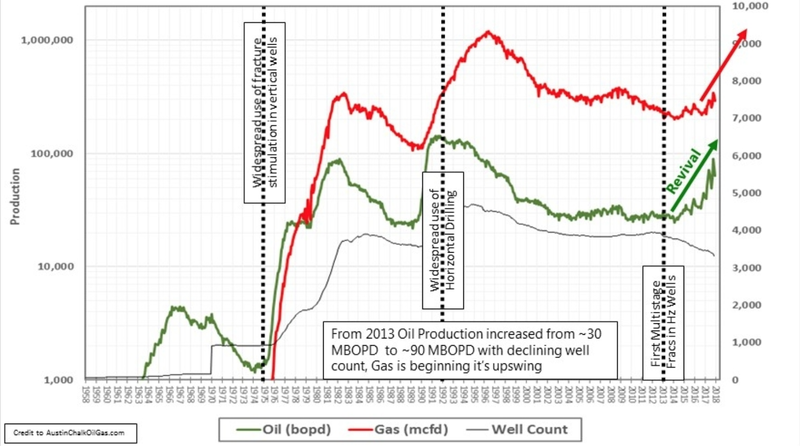 Then beginning 2013, the operators used the modern unconventional oil development technologies - the combination of horizontal drilling and fracturing stimulation - to produce oil from the Austin Chalk, thus partly solving the old problem of repeatability of well results and successfully reviving the old reservoir (Fig. 5). Fig. 5. History of Austin Chalk oil and gas production interpreted. Source. The Eagle Ford Formation is thought to be the primary source of most of the oil in the Austin Chalk, with the rest sourced from the carbonaceous beds within the chalk itself. Through microfractures oil migrated from the Eagle Ford Formation into the chalk, filling the joints and matrix pores. Gassier reservoirs tend to occur deeper, while oilier reservoirs shallower, reflecting the increased generation of gas at greater depths. Gas expansion is the main driving mechanism in the reservoirs (Fig. 6). Fig. 6. A cross section of the Giddings Field, showing the relative structural positions of the oil, oil/gas, and gas zones. Source. According to a 2011 study by USGS (see here), a total mean of 879 MMbo, 1.3 Tcfg, and 106 MMbbl of NGLs, for a total of 1,200 MMboe, of unconventional, undiscovered, technically recoverable resources are assessed for the Austin Pearsall-Giddings Area oil assessment unit (Fig. 7). Fig. 7. A map showing the Austin Pearsall-Giddings Area oil assessment unit and the Giddings Field. Source. In South Texas, the Austin Chalk just plays the second fiddle to the thicker and more consistent Eagle Ford shale play. Major developers of the Eagle Ford play active there include EOG Resources (EOG), ConocoPhillips (COP), BHP Billiton or now BP (BP), Chesapeake Energy (CHK), Encana (ECA), and Marathon Oil (MRO), among others. In East Texas, Kayne Anderson-backed Treadstone Energy Partners II, LLC holds acreage in the Austin Chalk (see here). 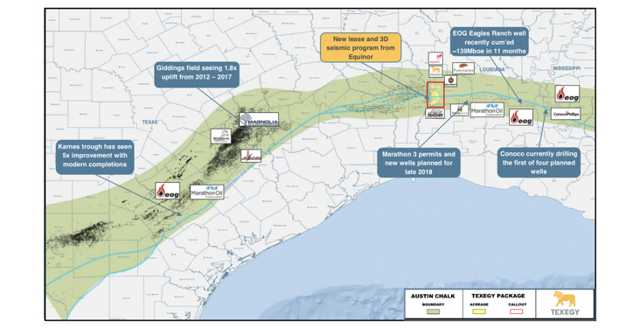 In Louisiana Austin Chalk, Equinor (EQNR) acquired 60,000 net acres in September 2018 from Texegy LLC for $75 million (see here); Marathon Oil owns 240,000 net acres, having entered the play at very low land prices (approximately $900/acre); Conoco Phillips (COP) holds 240,000 acres in the Louisiana Austin Chalk; Chevron (CVX) is also present. Fig. 8. The Austin Chalk Play in Louisiana. Source and Source. 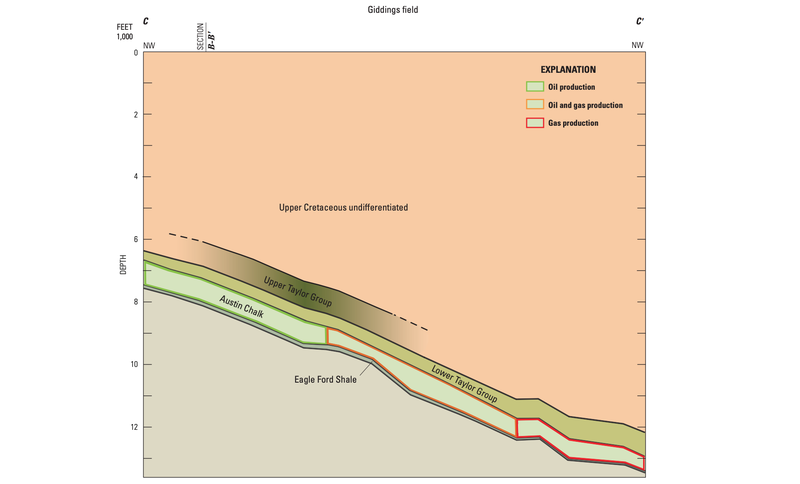 In the core area of the Gen 3 Austin Chalk Play, the Austin Chalk has substantial matrix porosity, thickness and hydrocarbon saturation, which permits a reliable calculation of minimum reservoir volume from well logs and other traditional geologic mapping techniques. 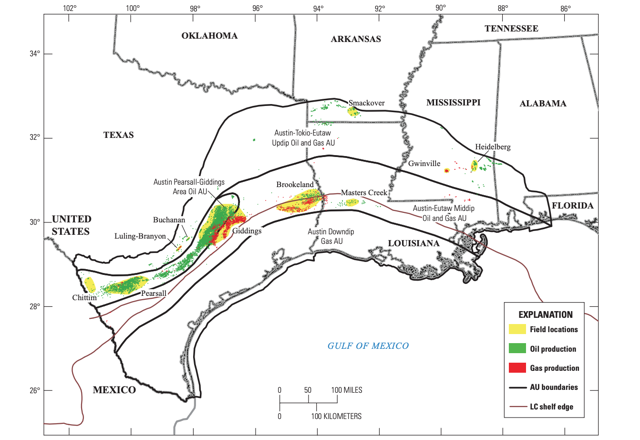 In these areas, the Austin Chalk has been shown to respond to the application of high intensity, modern multi-stage plug and perf frac techniques originally developed for and implemented in shale plays such as the Eagle Ford shale. Major operators in the area include EOG; WildHorse Resource Development which was acquired by Chesapeake in October 2018 (see here); Ares-backed BlackBrush Oil & Gas, L.P.; GeoSouthern Energy Corporation; EnCap-backed Verdun Oil Company; BHP (now BP); and EnerVest, whose Austin Chalk assets were rolled into Magnolia Oil & Gas Corporation (MGY) through a $2.66 billion transaction with TPG Pace Energy Holdings (Fig. 9). Fig. 9. Selected developers of the Austin Chalk. Source. The Austin Chalk can be characterized as a hybrid play, crossing over between the conventional fractured carbonate reservoirs and unconventional carbonate matrix reservoirs. Therefore, to a certain degree, it still has the old problems which used to plague the vertical well drilling developers, i.e., repeatability and rapid decline. In order to tap into the enormous resource base in the play, the operators strive to find the optimal technique to produce from the Austin Chalk in a consistent, slow-decline fashion. On the other hand, the proximity to the Gulf Coast accords the Austin Chalk with two advantages over the Permian Basin. The area has adequate midstream infrastructure, which helps lower the capital expenditure of field development. The oil produced from the Austin Chalk can capture product prices close to LLS. "Breakevens in the Austin Chalk overall are equal to premium unconventionals in the United States, at under $40/bbl. However, the Giddings area breakevens have varied widely, so 2018 will be critical to determining the viability of the Austin Chalk outside of the Karnes County, Texas, area." Sign up today at The Natural Resources Hub before the planned rate raise and benefit from Laurentian Research's in-depth research right away! Disclosure: I/we have no positions in any stocks mentioned, but may initiate a long position in MGY over the next 72 hours. I wrote this article myself, and it expresses my own opinions. I am not receiving compensation for it (other than from Seeking Alpha). I have no business relationship with any company whose stock is mentioned in this article.